Is Engelland Worthy of His Salary? Back on July 1, 2014, many Calgary Flames fans thought signing Deryk Engelland, a 32-year-old journeyman defenceman, was complete lunacy. After all, he didn’t play consistently in the NHL until he was 28 and the three-year, $8.7 million deal he signed ($2.9 million per season) was perceived as an overpayment. However, after the first 16 games of the 2016-17 season, Engelland is without question performing as the best defencemen on the team. This season he averages almost 20 minutes in ice time and leads all Flames defencemen with a plus/minus of plus-eight with T.J. Brodie holding down the team low at minus-11. In fact, Engelland is the only defender on the club to have a positive plus-minus rating while playing in every game this season. He’s also on pace to exceed his career best in points due to, at least in part, his clocking of more than five minutes per game than he averaged last season. During his first campaign in Calgary, Engelland was underwhelming at best. He finished the 2014-15 season with the lowest plus/minus (minus-16) and was viewed by many to be the weakest link on a Flames club that battled its way unexpectedly into the second round of the playoffs. At the time, Engelland was criticized for his slow foot speed, his undisciplined play, and his big contract. Perhaps the dollars spent on him should’ve been directed toward a younger and faster top-six forward? However, the criticism wasn’t new to Engelland who grinded through seven seasons in the American Hockey League and ECHL after turning pro in 2003-04 with the Las Vegas Wranglers. While there, he was coached for two seasons by none other than current Flames bench boss Glen Gulutzan. When the pair were reunited this season in Calgary, Gulutzan remarked that Engelland slimmed down from his days in Las Vegas and lauded the way he had mentored Flames youngsters such as Brett Kulak. Kulak’s development has been particularly impressive this season as the mobile defender has tallied three assists in just eight games with a plus/minus of plus-three to rank third among Flames defencemen. All that in just half the number of games played and after an off game versus the New York Rangers on Saturday when Kulak was a disappointing minus-four. In almost every game since being called up from Stockton of the AHL, Kulak has been paired with Engelland and thanks to their steady play, the two have logged just a couple of minutes less ice-time per game as Flames stars Mark Giordano and Dougie Hamilton. What Will Make the Flames Successful? The Flames need to focus on the basics and improve their results on special teams to find success this season. (Phillip MacCallum/Flickr). Right now, the Flames blue line looks fragile and far too tentative as the team has declined from their early season potential to become the first in the NHL to reach ten losses. Meanwhile, offensive stars like Johnny Gaudreau and Sean Monahan are pressing to make risky plays and the scramble is causing costly turnovers that often end up in the Flames net. On special teams, the Flames’ penalty kill and power play both rank 29th in the league. This, on top of the overall lack of scoring, leaves most fans to wonder just what it will take to pull the club out of their rut and back to respectability? Maybe the answer lies in the way Derek Engelland plays on the ice and the way he understands his role? He told the Calgary Herald it was best when he was signed back in 2014. 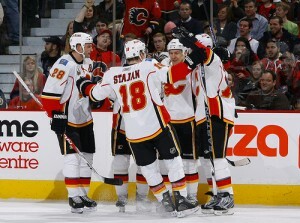 Wouldn’t it be nice if the Flames adopted the same philosophy and figured out how to play as a team? If they don’t, it looks as though the rebuild in Calgary may take a few seasons more than anyone hoped.